Magic Mirror is Hong Kong's first and most popular hair salon for kids providing haircuts for all ages since 1992! Our stylists are specially trained to cut kids' hair including newborn babies and our salons are designed with a sense of fun to put kids at ease. 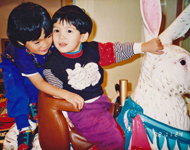 During the haircut, kids get to sit on carousel animals and watch their favourite cartoons. We also have a wide selection of toys for younger children and first-time haircut keepsakes to treasure your child's first lock of hair. The conundrum of where or how to cut your kid's hair is one faced by millions of parents around the world. Kids' attention spans are limited and they do not like sitting still for a haircut. Trying to cut your kid's hair at home has the potential to go horribly wrong and very messy! When one father encountered this problem with his son, he thought, "Wouldn't it be a great if there was a hair salon just for kids where kids actually looked forward to getting a haircut instead of dreading it?" It was then that the idea for Magic Mirror was born! 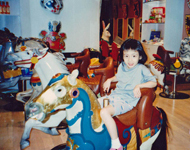 The first Magic Mirror and Hong Kong's first hair salon for kids opened in 1992 at Lee Gardens to much fanfare. No one had ever heard of a hair salon for kids, and yet, it was a godsend for many parents. Magic Mirror wasn't just a salon however - there were magic shows, the latest cartoons on laserdisc, a playroom, candy and so much other fun stuff! Magic Mirror has provided haircuts for an entire generation of children in Hong Kong and a new second generation of previous customers' children is now emerging. Our unique history, concept and brand continues to grow in Hong Kong and it is our ambition to bring these into Southeast Asia and Mainland China in the coming years.